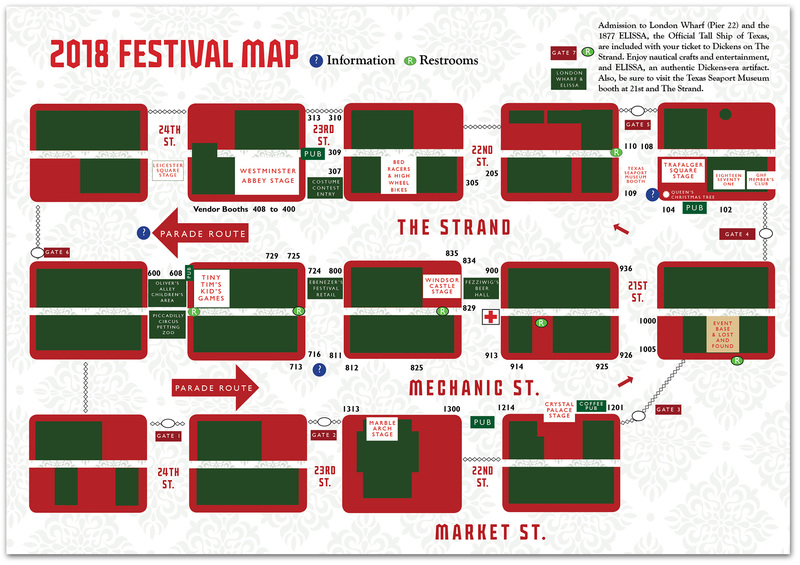 Click here to download a PDF version of the map and schedule. Friday (Free Admission – Fezziwig’s Beer Hall) – 5 – 9 p.m.
Saturday – 10 a.m. – 9 p.m.
Sunday – 12 – 6 p.m.
Children 6 & Under are free! WEAR A VICTORIAN COSTUME FOR 1/2 PRICE ADULT ADMISSION! Galveston is located approximately 45 minutes south of Houston. Take I-45 south for approximately 50 miles. After you cross the causeway linking the mainland to Galveston, I-45 will become Broadway, and the cross streets will be numbered in decreasing order. To reach the Strand National Historic Landmark District, the site of Dickens on The Strand, turn left onto any of the streets designated 24th Street [Mitchell], 22nd Street [Kempner] or 21st Street [Moody]. (Left turns are not allowed in either direction onto 23rd Street [Tremont]). After making this turn, you will be heading in a northerly direction, toward Galveston Bay. These streets all intersect Mechanic Street at the perimeter of the festival site. Pets and ice chests are not allowed. Scooters, skateboards, rollerblades, skates, Segways and other recreational “wheels” are forbidden. Guests bringing in costume weapons and props must have them secured will be asked to go through additional screening. Dressing the part of a Victorian lady or gent can be as easy as pulling together pieces hanging in the back of the closet. Or it could be as fun as finding a vintage dress or suit in a thrift shop or antique store. Others even have costumes custom-made for the event. Whatever route is chosen, below you will find a quick guide to the basics of Victorian dressing. 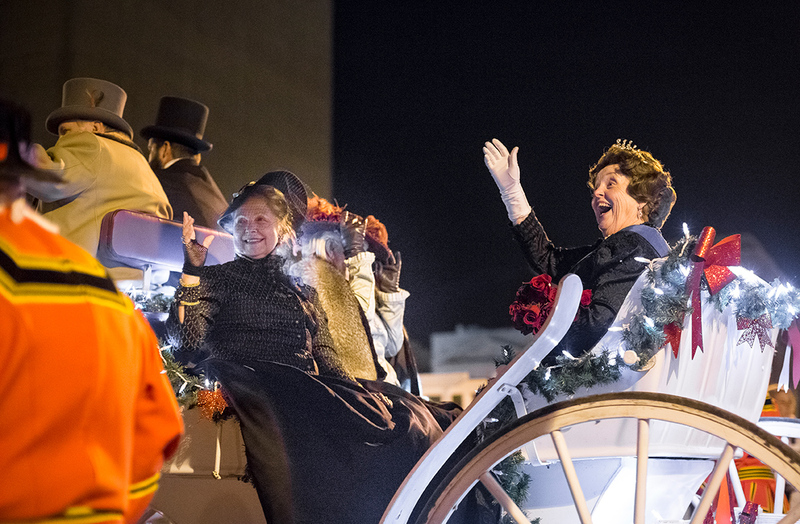 Remember, dressing the part of Dickens on The Strand not only reduces your admission price, it also helps visitors get the most enjoyment out of the holiday event. 1. Every lady wore a hat. Outside, ladies usually wore bonnets of some kind, trimmed with feathers, flowers, ribbons and bows. Create a bonnet easily from an old straw or felt hat from a thrift shop. Indoors, ladies often wore small lace caps that can be fashioned today from lace handkerchiefs, a flower and a few small ribbons. Domestic servants wore mopcaps.2. A Victorian dress usually had a high neckline, sometimes with a collar and fitted bodice, three-quarter length full sleeves and a very full, long skirt worn over layered petticoats or a hoop. With a few amendments, such as adding more fullness to the skirt, accenting with ribbons, braid, lace and flowers, and even adding a collar, any thrift-shop find can be transformed into a lovely Victorian dress. Keep in mind that solids and small prints were more common, but stripes and plaids also were popular. Cotton, lightweight wools or any fabric that looks like silk or brocade would most resemble period cloth.3. When choosing a long skirt, accent it with ribbons, lace and a full petticoat or hoop. A high-necked blouse with a cloak, mantle, shawl or pelerine jacket completes this easy outfit.4. A working class woman would wear simple dress with narrow sleeves and a dark material, with no petticoats. She might wear a bibbed apron over the dress, with a shawl tied over her shoulders.5. Dark stockings and slipper-type shoes or ladies’ boots were worn during this period. To complete the outfit, a lady would add a bonnet to match her dress, gloves, a fan and a small purse. 1. Hats are a must. A gentleman always wore a hat of some kind when he was outside. Even working-class men are pictured with battered top hats or lower-crowned, broad-brimmed hats. Tweed skimmers were more sporty versions of Victorian attire.2. A plain white shirt can be given a period look by turning the collar up. Add a ribbon, scarf or fancy cravat and knot in front. A working man would wear a collarless shirt or smock, with sleeves rolled up.3. A vest [or waistcoat] of brocade, velvet or silk will help create a gentleman’s costume. A waistcoat of wool in bright colored strips or plaid will make any 21st Century man a sporting 19th Century chap or shopkeeper.4. Tapered pants in black, grey or buff with a strip of ribbon running down the outer seam were a gentleman’s normal attire. A working man would wear a baggy pair of pants in wool or corduroy.5. A frock coat or tailcoat is easy to create, using a dark overcoat or raincoat. Trim the collar with velvet, silk or brocade, and move the first button to mid-chest, causing the coat to fall in a cutaway fashion. A laborer, fisherman or stallkeeper would have a wool coat with a scarf tied around the neck. 1. Boys wore trousers, shirts and coats as grown men did. A cap or small top hat also was common. The younger boys wore knickers, and the “young men” wore trousers. 2. Girls wore low frocks fastened behind, and short sleeves. When they went outside, they put on a cloak or shawl. Upper-class parents dressed their girls like miniatures, reproducing on a small scale each detail of puff, frill and elaborate decoration. The more common folk tended to be thrifty, and would reuse garments to make their children’s clothes. 3. Babies were dressed in layers of flannel or cotton petticoats to combine warmth and ease of washing. Caps, with rows and rows of lace, looked dear around an infant’s face. It was fashionable to drape baby in a simple circular cape while outside. Tickets are non-refundable. The festival is open rain or shine. GHF is not responsible for independent transactions between visitors and vendors. 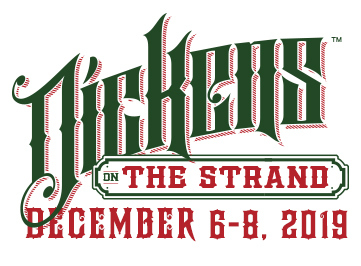 We are committed to making Dickens on The Strand special needs accessible. If we can assist with arrangements, please contact us at 409-765-7834 in advance of your visit.